New! Last minute glamping deals for midweek breaks arriving within 14 days. I am aware there is no mains electricity on site. I understand that it is against the law to smoke inside or around accommodation. I have made sure all my party have seen the accommodation and sites location on the website. Our Yurt holidays in Somerset are the perfect getaway for families, groups or couples. 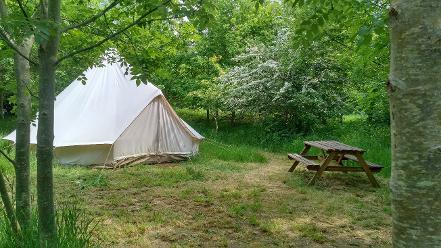 With none of the distractions of modern life, a glamping break in the woods can be an experience to bring the whole family together, or to reconnect with friends and loved ones in person, in a tranquil woodland setting. 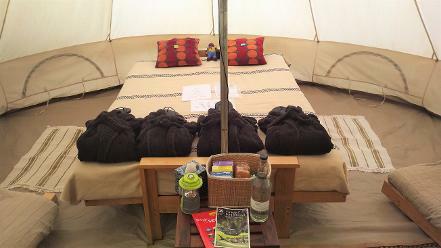 Our woodland glamping tents come complete with a double bed and single futon sofa beds to sleep four people. Hot tub glamping is back at Woodland Escape for 2018 with our lovely off-grid wood-fired tub! Each guest hiring the hot tub is provided with a towel set, a gown and flip-flops when glamping with hot tub hire with us in Somerset. 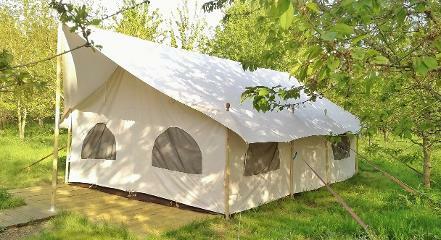 Our newest accommodation here in Somerset, the canvas glamping lodge is ideal for larger families. 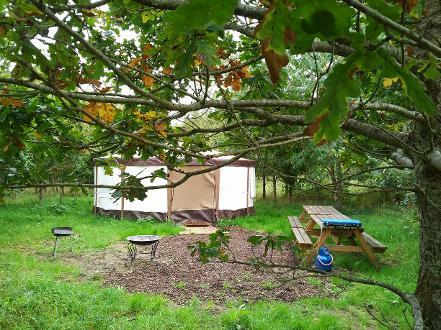 Going glamping with kids is a perfect way to introduce them to the great outdoors or reward hardy campers with a little bit of off-grid woodland luxury. Here at Woodland Escape we understand how our canine friends are part of the family and we welcome dogs glamping here with us in Somerset. There is a small charge per pet to cover the additional hypo-allergenic cleaning required in case subsequent guests have allergies. Our Deluxe glamping packages mean you can save money by bundling in many additional items instead of separately ordering all of the optional extra luxuries available on request. The Deluxe packages include all bedding, towels, plus logs, kindling, charcoal & firelighters and marshmallows to roast. With a comfortable camping-style experience, glamping is a great way of introducing children of all ages to the great outdoors. 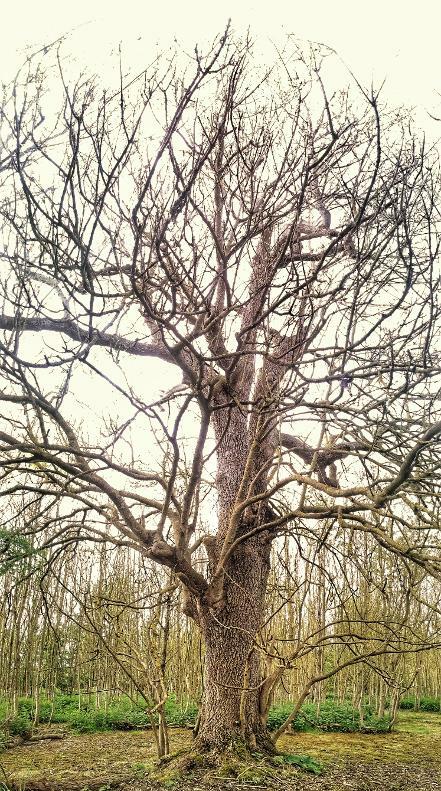 The unique setting at Woodland Escape is conducive to learning new skills such as making fires and cooking out in the open, as well as discovering nature. 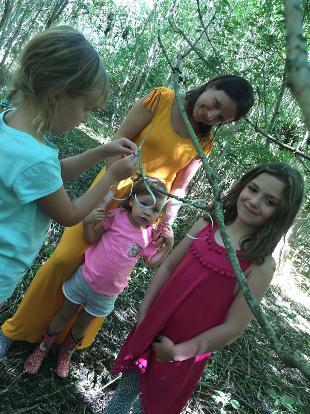 Young children staying with us at Woodland Escape are each given a ribbon to tie on to our Wishing Tree, a central feature of our wood, two old trees an Oak and an Ash growing in harmony intertwined, and make a wish. New for 2018 we have created two exclusive woodland camping pitches, each approximately 5 metres, enough space for a conventional 6-man tent. 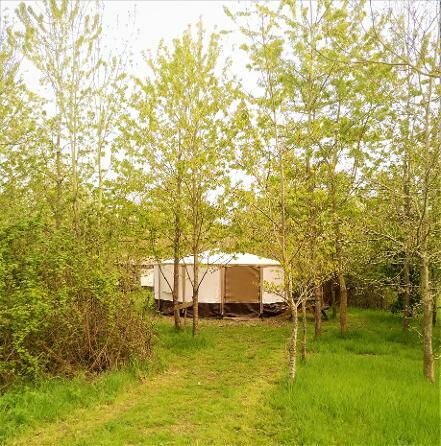 Traditionally for use alongside glamping guests to provide additional accommodation, these are occasionally available to hire individually or together for guests to come camping in the woods with us here in Somerset.